Coconut oil is solid at room temperature like butter and doesn’t break down in heat or light or become rancid like many other oils. It is classified as a saturated fat, and it is this label that leads people to believe that coconut oil must be bad for you. Saturated fat has become the most controversial type of fat over the last few decades. On a daily basis we are advised to avoid saturated fat and to consume their low fat counterparts to reduce the risk of heart disease and obesity. But more and more research is now finding that saturated fat might not be the problem after all. The fact is our body needs fats (including and especially saturated fat) to function! Saturated fat is found naturally in most animal products such as meat, eggs, lard, full fat dairy products such as butter and cream, coconuts, coconut oil, palm oil and dark chocolate. So let’s talk about the fats that are bad for us- Trans fats are a type of unsaturated fat which increases our risk of heart disease by increasing the “bad” LDL cholesterol, while also lowering the “good” HDL cholesterol in our blood. Naturally occurring trans fats are found in small amounts in dairy products, beef, veal, lamb and mutton, though the ones to avoid are the artificial, synthetic, industrial or manufactured types of trans fats. These artificial fats are made using the process of hydrogenation which produces rancid, thickened vegetable and seeds oils that are solid at room temperature. They are also found in foods that use hydrogenated or partially hydrogenated vegetable fats, such as deep-fried food, baked foods, and margarine. It is these processed fats that have been found to be the true enemy (even though they were named as being heart friendly and healthy for the last 60 years). To minimise trans fats consumption try to limit the amount of fast foods, take-away meals, deep-fried foods, baked foods, store bought biscuits, pastries, pies, margarine and cakes in your diet. Coconut oil contains medium-chain fatty acids or MCTs that have powerful medicinal properties. These fatty acids are turned into ketone bodies which have been found to have therapeutic effects on brain disorders like epilepsy and Alzheimer’s. Populations that thrive on eating coconuts have been found to have excellent health with no evidence of heart disease. Where coconuts are a dietary staple, such as in the south pacific, these populations take 60% of their calories from coconuts and are the biggest consumers of saturated fat in the world, have great health and no evidence of heart disease. It would be safe to say that generations of these populations have been thriving on the consumption of coconuts. Coconut oil contains strong antibacterial, antiviral and antifungal properties. Coconut oil has been shown to have adverse effects on fungi and yeast, as well as harmful pathogens such as the bacteria Staphylococcus Aureus and the yeast Candida Albicans. Coconut oil contains the highest amount of Lauric acid- a powerful virus and bacterial destroyer. Lauric acid is additionally converted to monolaurin which contains strong anti-viral, anti-bacterial and anti-protozoa properties. Capric acid, which is also found in coconut oil, contains anti-microbial properties. Based on this information, I think it’s safe to say that consuming coconut oil on a daily basis will have a positive effect on your immune system. Coconut oil improves digestive function. Bacteria, fungi and parasites can often cause indigestion and poor absorption. Due to coconut oil’s antimicrobial properties, coconut oil has been found to improve digestive function and absorption of vitamins, minerals and amino acids and reduce various stomach and digestion-related problems including irritable bowel syndrome. The medium-chain triglycerides (MCT’s) found in coconut oil can help boost metabolism and promote weight loss. Since MCT travels straight to the liver form the digestive tract, it can be used as a quick source of energy. It also helps the feeling of satiety and can therefore assist with weight loss. Coconut oil can increase the body’s absorption of minerals essential for bone health. It was found that coconut oil increased absorption of calcium, vitamin D and other minerals essential for bone health and strength. Studies show that coconut oil may help increase thyroid function. Coconut oil has been found to raise basal body temperature whilst increasing metabolism. This in turn helps people that suffer with low thyroid function. Coconut oil contains anti-ageing properties that help your skin stay healthy and rejuvenated. Coconut oil contains the antioxidant vitamin E, which is essential for skin growth, repair, keeping the skin smooth, and protecting it against cracking. Above all, it prevents premature ageing and wrinkling of the skin due to its antioxidant properties. 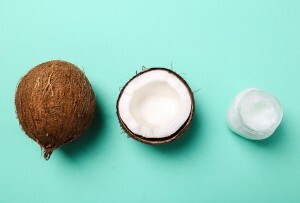 Coconut oil can be used all over the body as a moisturiser, lip balm, deodorant and makeup remover and as well as for skin disorders such as eczema, due to its natural anti-fungal properties. Coconut oil is a safe oil to use for cooking, due to its high heat tolerance. I only ever use three oils in my food preparation. The first two are extra virgin olive oil and flaxseed oil, perfect for making home-made salad dressings. The other is coconut oil, which is the only oil that is stable enough to resist mild heat-induced damage. I normally don’t recommend frying foods but if you must, then coconut oil is your safest choice. Coconut oil has been found to improve the nutrition of sick children and adults. Children with certain diseases that result in poor absorption in the stomach and intestines have found that the ease of absorption and digestion of MCFA’s found in coconut oil, helped increase their total calorie intake. This not only helps to maintain weight, but also improved nutrition and overall growth patterns. This is especially important in improving immune system function in sick individuals.